The production, analysis and presentation of Indigenous data are not neutral interpretations of numerical counts. Institutionally positioned within a portrayal of Australian national social trends, the data‟s ubiquity belies their discursive power. By virtue of the racialised terrain in which they are conceived, collected, analysed and interpreted the data are politicised in ways mostly invisible to their producers and users. This racialised „politics of the data‟ is the focus of this article. 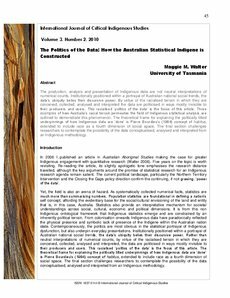 Three examples of how Australia‟s racial terrain permeates the field of Indigenous statistical analysis are outlined to demonstrate this phenomenon. The theoretical frame for explaining the politically tilted underpinnings of how Indigenous data are „done‟ is Pierre Bourdieu‟s (1984) concept of habitus, extended to include race as a fourth dimension of social space. The final section challenges researchers to contemplate the possibility of the data conceptualised, analysed and interpreted from an Indigenous methodology.